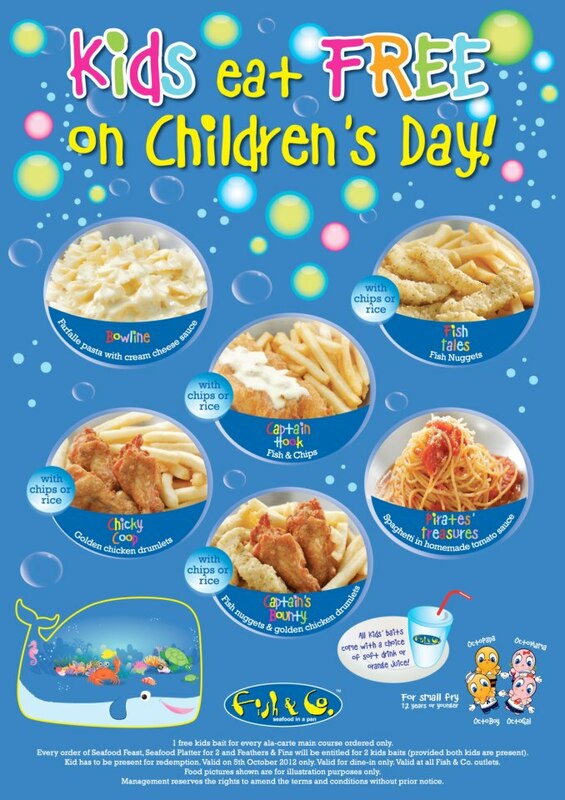 On the 5th of October, Fish & Co. will be celebrating Children's Day by letting ALL kids eat for absolutely FREE! 1 Free Kids Bait for every ala-carte main course ordered, and every order of Seafood Feast, Seafood Platter for 2 and Feathers & Fins will be entitled to 2 kids baits! Sound like a great deal? We hope to see you on the 5th Oct! - Valid on 5th October 2012 only. - Valid at all Fish & Co. outlets. - Not valid with other on-going promotions, discounts, vouchers, privileges and/or offers. - Kid has to be present for redemption. - Food pictures shown are for illustration purposes only. - Management reserves the rights to amend the terms and conditions without prior notice.